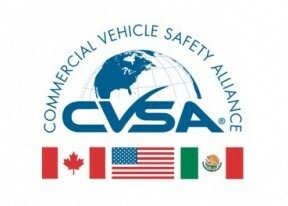 The Commercial Vehicle Safety Alliance (CVSA) recently updated their out of service criteria and all changes have been in effect since April 1, 2019. •	Driver’s Seat (Missing); a. To provide an out-of-service condition for a missing driver’s seat. Drivers using a temporary seat rather than a permanent seat that is secured to the vehicle in a workmanlike manner was added to the out-of-service criteria. •	Driver Medical/Physical Requirements; a. Skill Performance Evaluation Certificate by modifying the language. A driver who possesses a valid Skill Performance Evaluation (SPE) but is not complying with the SPE requirements should be placed out of service. •	Brake Systems; g. Brake Drums and Rotors (Discs), (2) by adding language and a picture for cracks in structural supports of a brake rotor. If there are cracks through the vents in rotors, a collapse of the rotor is imminent; therefore, the vehicle should be placed out of service. •	Steering Mechanisms; h. Tie Rods and Drag Links, (3) to add an out-of-service condition for a non-manufactured hole. A non-manufactured hole in a drag link should be placed out of service.